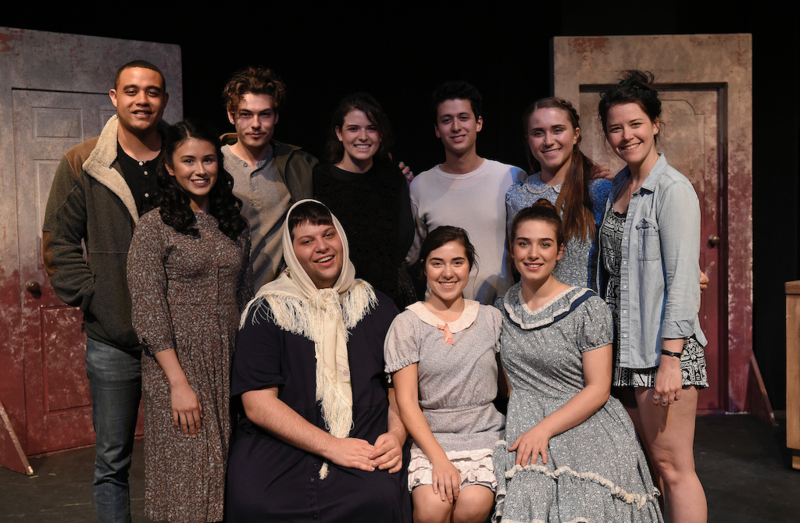 “A Stone Is Nobody’s,” the second show in the School of Dramatic Arts’ New Works Festival, premiered Friday and ran through the weekend at Massman Theatre. The play, set in an untethered time and place gracefully toeing the line between the real and the imagined, told a story of growing up, letting go and choosing to stay through the lens of a family’s tragic struggle for love. As the lights dimmed and the play began, the quiet calm was replaced by a violent storm, an intense flash of white light and a cacophony that gave way to a haunting silence, foreshadowing the tumultuous tale the characters — and the audience — were about to experience. Sophomore theatre major Santiago Gavidia, who portrayed the main character Gently, said the relationship between Gently and his mother Luella was abusive and remained the show’s main source of tension. Noa Gardner, the show’s playwright and a theatre MFA student, worked closely alongside the actors and director Cara Phipps to refine his work in a process cast members said was extremely flexible and collaborative. “As we evolved in our process, and as Noa evolved in his process, I think we found a little more love for Luella and slowly that character become more complex,” Gavidia said. Luella’s complexity was evident in the family’s tense and erratic dynamics, emphasized further by the family’s only friend, Davina — portrayed by freshman theatre major Fiona Baquerizo — who acted both as a comic relief and as a grounding force that ultimately kept the family together. Brought to their breaking points multiple times throughout the play, the characters never give up on each other, even when they seem trapped in a loveless cycle of possession and resentment. The plot of the play spans many years, as evidenced by Gavidia’s growth from a young boy to a young man throughout the show. Gavidia’s aging was the only real indication that time was passing, and his ability to walk offstage as one age and emerge moments later as an older version of himself helped the audience’s understanding of the story. Several of the cast members were also tasked with particularly difficult roles as members of the chorus. Assuming roles that included young girls, fishermen, elders and pregnant women, the chorus transitioned effortlessly between ages and genders to create the characters’ complex world. The demand for actors to play many different roles, paired with moments that deliberately push the parameters of reality through distinct lighting changes, contributed to the show’s folklore, as Baquerizo put it. The simple re-configurations of set pieces — a quilt on the kitchen table to signify a bed or an upside-down table and a few chairs to create a fishing boat — conveyed different locations, as well as the consistent miming of props, added to a world of both simplicity and fantasy. The play breaks the convention of miming props in the final scene in which Gently and Luella sit down at the kitchen table and eat a grilled cheese sandwich with soup. This hauntingly simple moment, which deliberately lasts an uncomfortable amount of time, harkens back to the opening scene, where a young Gently asks his mother for a grilled cheese sandwich and she “makes” him one, which is, in reality, an empty plate that he “eats” off of. Luella continuously rejects the idea that people need to eat to survive. The lack of food in their home mirrors the absence of love. Although mother and son push and pull against each other and external forces — paralleling the sound design of waves crashing against the shore before being pulled back to sea — at the end of the day, there is just the two of them sitting at a table, breaking the cycle, finally expressing their love for one another.